Not making rational decisions. Some dogs will panic and do things they normally never would. An otherwise sweet dog may nip at someone if there is a loud clap of thunder. Even if your dog spends a lot of time outside, it is a good idea to bring them inside during lightning storms. Even if they have a great dog house, barn, or other areas all to themselves, it can be comforting to them to have their loving family around them. It is better that they “hide out” with you than panicking or running off. You can also get a dog house that you can put inside to create a safe space for them. Taking your dog’s mind off of the thunder is a step in the right direction. Special snacks, a new chew toy, or just trying to pet them and play with them a little can keep their mind off concentrattin on the noise. This stick inspired treat dispenser will keep your dog busy. Just stuff a few little snacks or fill with peanut butter and watch how fast that thunderstorm is at the back of their mind! If they like to play fetch, this is a good toy to do it with if it is not filled with distracting delicious snacks. I like to recommend toys like this that you can get a lot of mileage out of and are made in the United States. 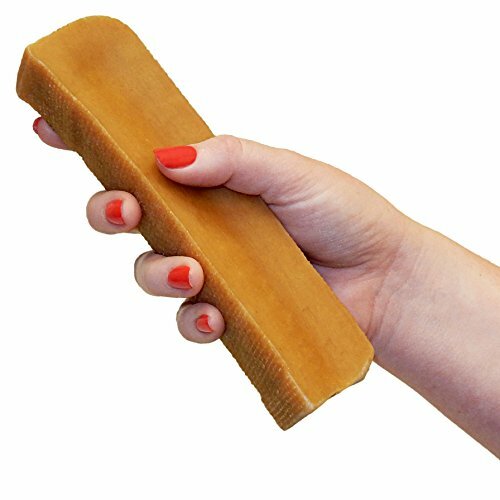 Yak Sticks have become a very popular and long-lasting favorite among dog parents. This natural treat is made of Yak Milk, Cow Milk, Lime Juice, and a small amount of salt. There are no artificial flavors or ingredients, just a cheesy natural flavor that dog’s love. 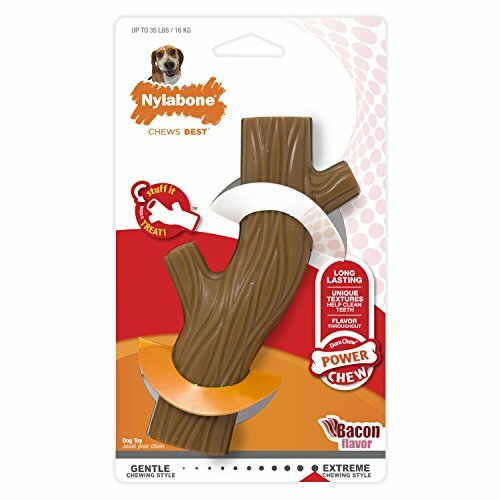 Yak Sticks are safer than rawhide treats because they are far easier to digest, especially for little dogs. You can get Yak Sticks in different sizes so all dogs can enjoy. Dogs that have been chained up outside during a lightning storm may be very hard to calm during any storm that happens after that. Electric current can travel and shock the dog some so they learn to be terrified of thunderstorms. Rescue dog parents should file this away so they know to give extra care and attention during scary storms. Over time some dogs may get less scared but from what I have seen, they will always be somewhat scared if they have been tied outside or have been shocked. This is one of the reasons it is so cruel to chain a dog during bad weather or for any major length of time. 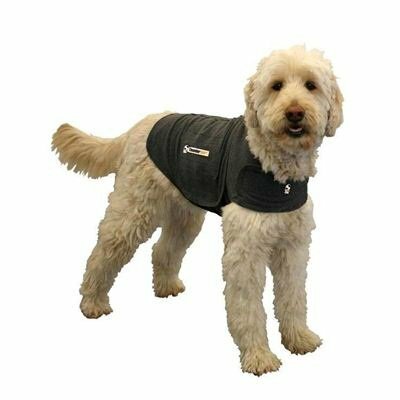 A thunder shirt is made to fit closely to your dog and give them a sense of protection and well being. The carefully applied pressure of the shirt soothes your dog’s anxiety and fear. If your dog doesn’t mind wearing a harness or they sometimes tolerate some clothing, then a thunder shirt may be just the solution you need to calm them down in any storm or stressful situation. This is the original classic thundershirt. 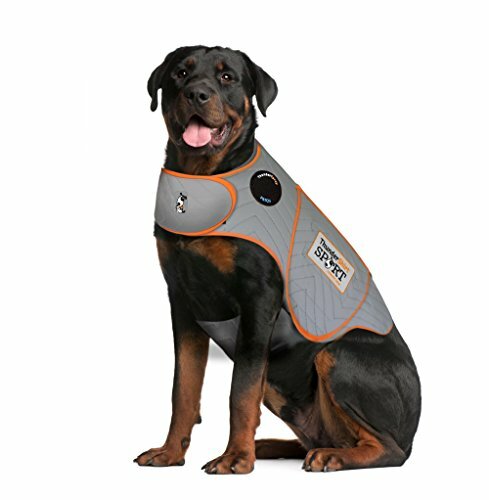 The wide range of sizes means there is a thundershirt to fit any scared pooch, even those over 110 lbs! Pet parents seem very happy with the results they get. The maker of the thundershirt states that the design was created by pet behaviorists and found to help over 80% of dogs that suffer from various types of anxiety. For dogs that like to keep active, the Thundershirt Sport model is tough enough to handle the job. This is a good solution if you have to take your dog somewhere noisy or loud. If you are visiting relatives in town for example and their is a fireworks display or you like to hike with your dog but don’t want them being so scared if a storm pops up. I know where I live a thunderstorm can pop up really fast. If you keep track of the weather and see a storm is coming, then you may want to consider a calmative made from natural ingredients. You can even get calmatives in the form of delicious little treats that make it easy to measure the right dosage. Plenty of pet parent’s use these for traveling with hyper or nervous pets. Of course, if your dog takes any prescriptions you may want to consult with your vet. Most dogs can take natural calming aids just fine. 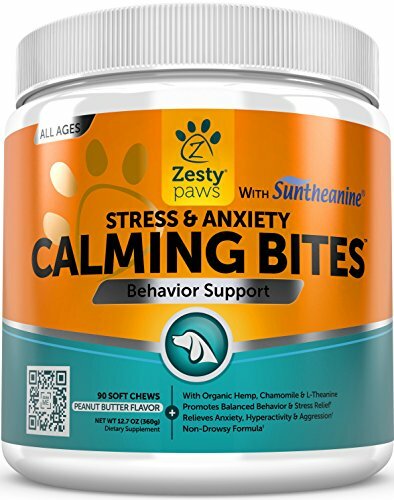 These calming choose naturally relieve anxiety in dogs and helps them sleep better. In fact, you can get the Turkey flavored version of this chew with Melatonin added for times when you really need your dog as calm as possible. This also means you can get the Peanut Butter flavor to use for average stress and then just use the Turkey with Melatonin for really bad storms, visits to the groomers, and the 4th of July. Some of the same things that calm you down can help calm and soothe your dog. Some dogs really do chill out when soothing music is played. It could be classical or smooth jazz or if you notice they seem to calm down when you play anything else in particular, make note of it for those scary times they have. 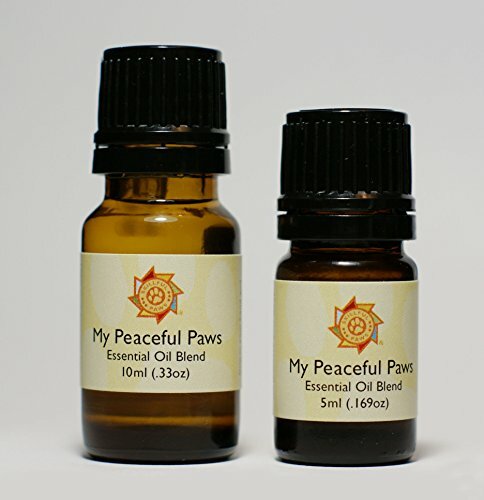 This highly concentrated blend of essential oils can be used in your pet’s sleeping areas or even rubbed on them to help soothe away stress and anxiety. If your dog stresses when you leave or you want to create the most soothing environment possible then you can put 6-7 drops of this oil in a standard essential oil diffuser. 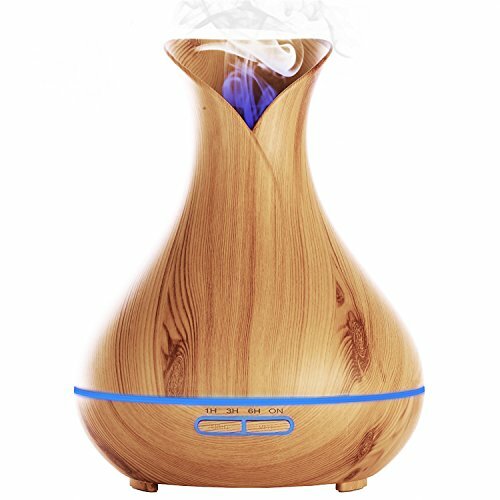 This diffuser is large enough for a bigger room or an apartment. When filled it can provide mist for up to 13 hours. 7 different light colors changing creates a soothing effect for you too! If you have a house with interior rooms or a basement you might consider creating a comfy spot for your dog to take refuge during a storm. You can take their bed to this room and they will be insulated from the worst of the noise. The flashing during a thunderstorm can also cause your dog distress. Drawing the window blinds or curtains in whatever room your dog is hanging out in can help. Consider a darker light blocking color for times like this. For a quick fix, hang a sheet over the window for extra light blocking. Black out curtain liners can change your existing thin curtains into the thick light blocking variety when needed. 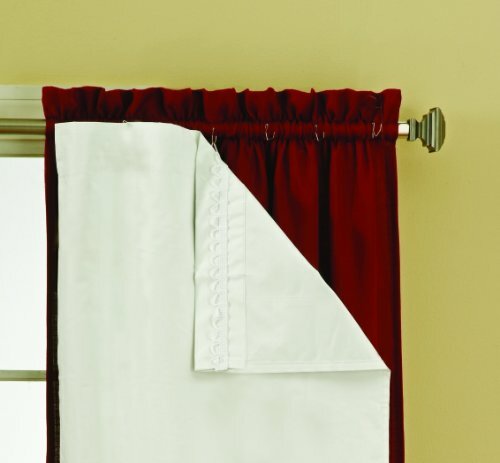 This is an inexpensive way to add insulative value and keep the curtains you have. Because dogs have unique personalities, it is impossible to pin point one solution that is best for all dogs. The level of anxiety can also vary greatly. A little bit of fear is different than a dog that is shaking like a leaf and trying to escape at the same time. The first step should be to bring them inside if at all possible and spend time with them. Try to distract them with a treat, snack, or toy. If this doesn’t work then you can try implementing any of the other solutions discussed in this post. It may take a few storms and trying out some items like a thundershirt before you find the combination that offers your pooch maximum relief from thunder anxiety.